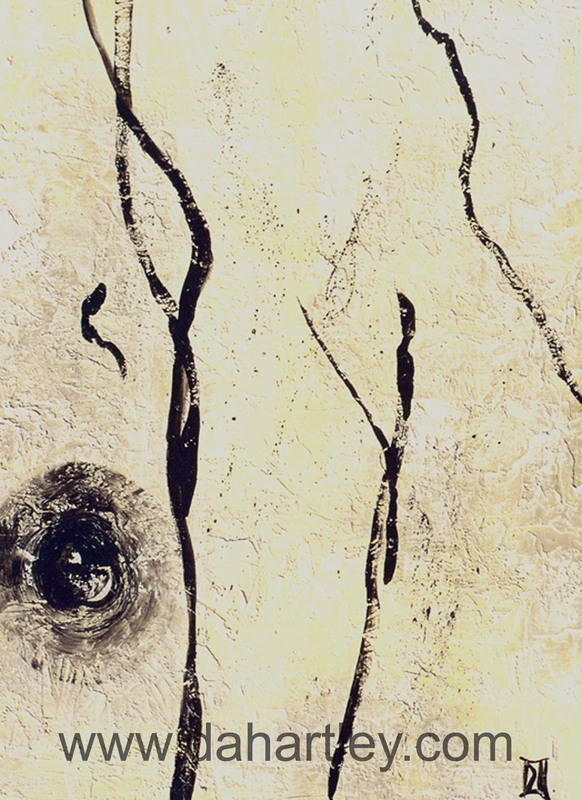 In this series, World of Abstraction, my paintings are based upon philosophical ideas, and addressing the unknown. Paintings by Denise Hartley. “Passage Way”. The opening into another dimension. How do we reach the unknown within ourselves? How do we learn about ourselves? So to know yourself is to forget yourself. This is to say that when we make friends with ourselves we no longer have to be so self-involved. It’s a curious twist: making friends with ourselves is a way of not being so self-involved anymore. Then Dogen Zen-ji goes on to say, “To forget yourself is to become enlightened by all things.” When we are not so self-involved, we begin to realize that the world is speaking to us all of the time. Every plant, every tree, every animal, every person, every car, every airplane is speaking to us, teaching us, awakening us. It’s a wonderful world, but we often miss it. It’s as if we see the previews of coming attractions and never get to the main feature. "Mitochondria I", mixed media and gold leaf on wood, 4' x 6', 2002. Private collection. "Mitochondria". Each of our cells can contain thousands of mitochondria. They are used by our bodies to convert molecules into energy. They are independent, and genetically distinct from the cell nucleus, and can manufacture their own proteins. It is thought that mitochondria originated as a separate single-cell organism that became symbiotic with their hosts, as to be indispensable. Mitochondrial DNA is a remnant of a past existence as a separate organism. Mitochondria contain their own DNA, which we only inherit from our mothers, and can be used to trace maternal links (The American Heritage Science Dictionary). “Jade Disc”, acrylic paint on canvas, 4’ x 6’, 2002. “Jade Disc”. 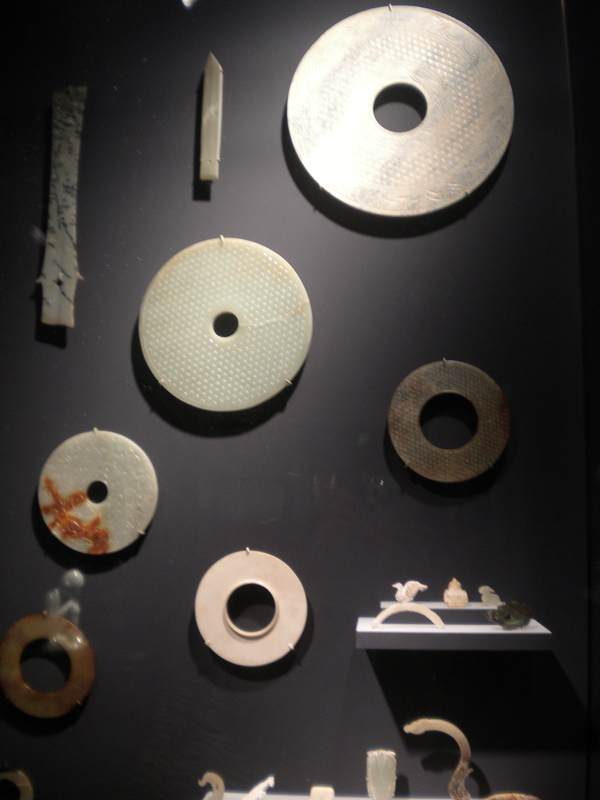 This disc is called a bi disc, it is a flat jade disc, with a circular hole in the center. They were used in Neolithic times, burial objects, undecorated, about 3000 B.C.E. The jade objects represent Heaven and were laid on the diseased. 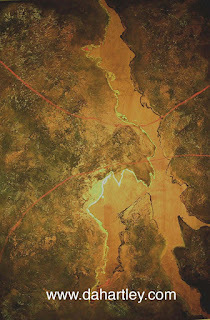 Tao”, mixed media, acrylic on canvas, 4’ x 6’, 2002. 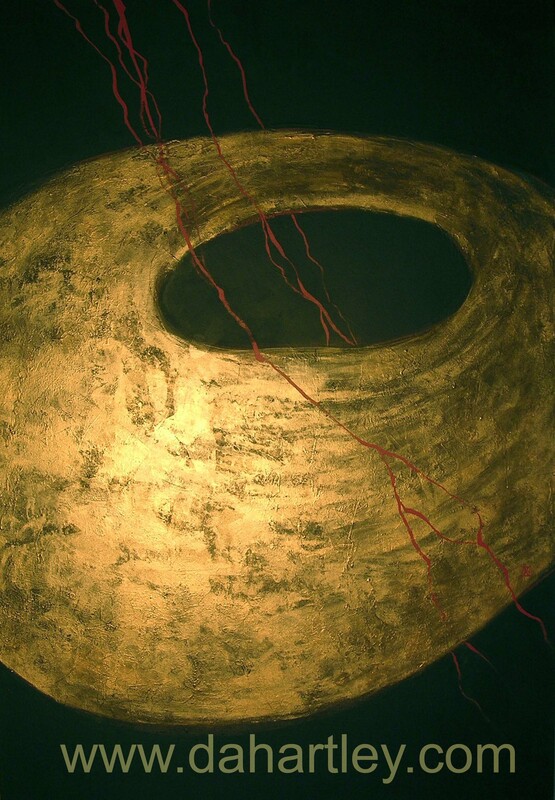 This painting represents the beginning of the universe. The red rays piercing the disc, are the sparks that create the Ten Thousand Things in our existence. The Tao that is unnamable is the Source of the Heaven and the Earth. The name, once introduced, becomes the Mother of the Ten Thousand Things. Being is born of nothingness. "Silent Passage", oil on gessoed wood, 4' x 6', 2003. Lao Tzu, The Tao Te Ching. The reason water can keep changing its form is because it is essentially formless. Its form is determined by what is around it. Put it in a cup, and it will be cup-shaped. Put it in a ravine, and it will be river-shaped. It needs no form of its own, because it harmonizes with everything around it, taking other beings as its outline, instead of imposing itself upon others. 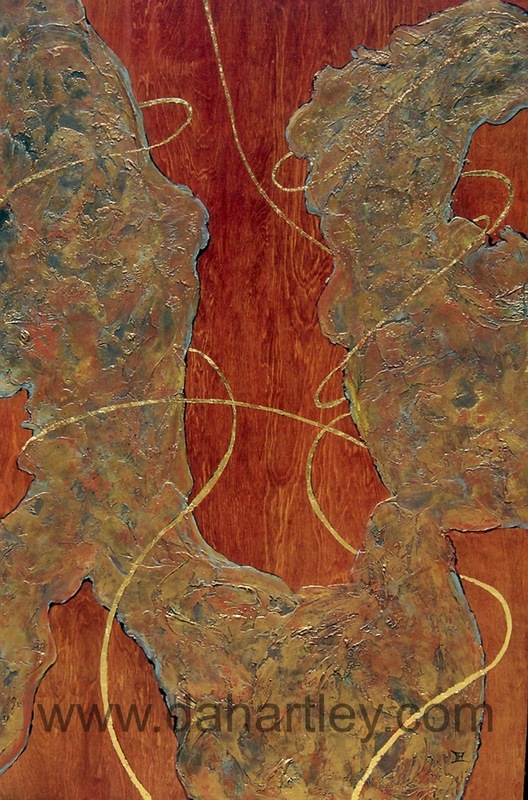 “Zen Drawing”, mixed media on wood, 3’ x 4’, 2002. Private Collection. “Zen Drawing”. Enlightenment, the first principle is possible acknowledging the everything and everyone is Buddha-nature. Enlightenment is possible to everyone. Enlightenment in Buddhism, or for the Taoist sage, is not expressible in words, or logical thought. Intuitive understanding is necessary, acknowledging that eternity is here and now.